When I was a little kid, if anyone asked me what my least favorite food was, I would almost always, without hesitation, say “green beans.” Maybe it was because I grew up eating canned green beans, or maybe it was because I had a general dislike of most green vegetables, but I hated them! At some point during my young adult years, I had a change of heart. 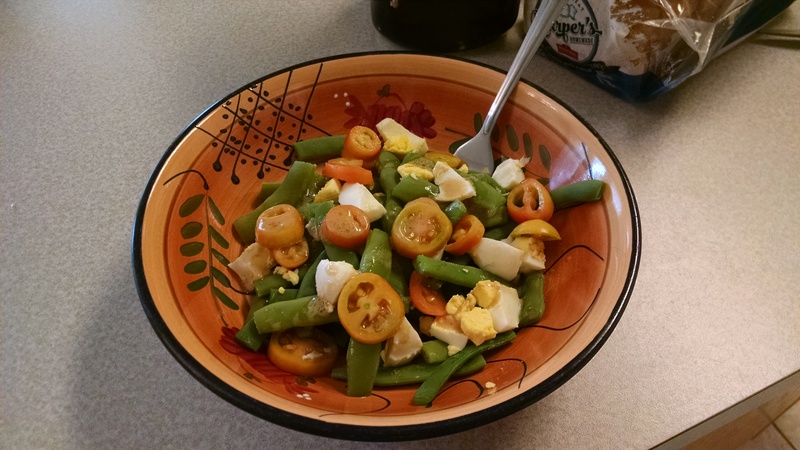 I tried fresh, “straight-from-the-garden” green beans, and thought they were delicious. I can honestly say now that I LOVE green beans! They are one of my favorite vegetables; and they are especially wonderful to eat from the garden. This year I grew “Kentucky Wonder” pole beans in my garden. 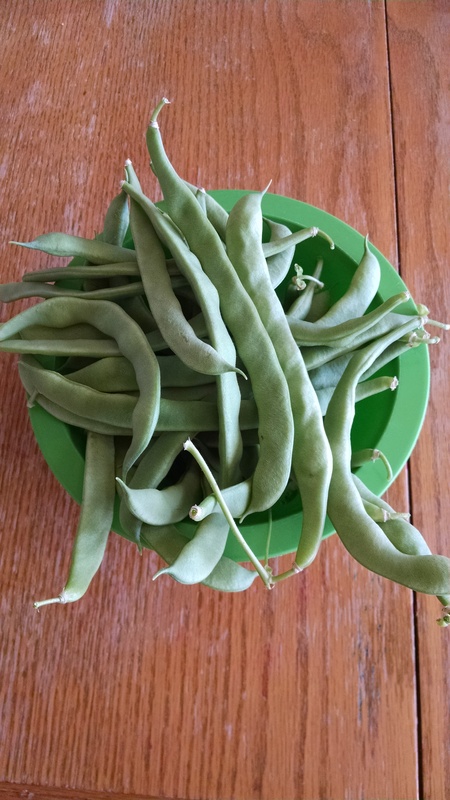 They did awesome in my humble garden, and I have been harvesting a big bowl of green beans every few days since late July. Green beans are “edible pod beans”, meaning you can eat the pod and the bean seeds. Other types of beans like lima beans and edamame are shell beans, and you only eat what is inside of the pod. Green beans come in two basic varieties: bush beans and pole beans. 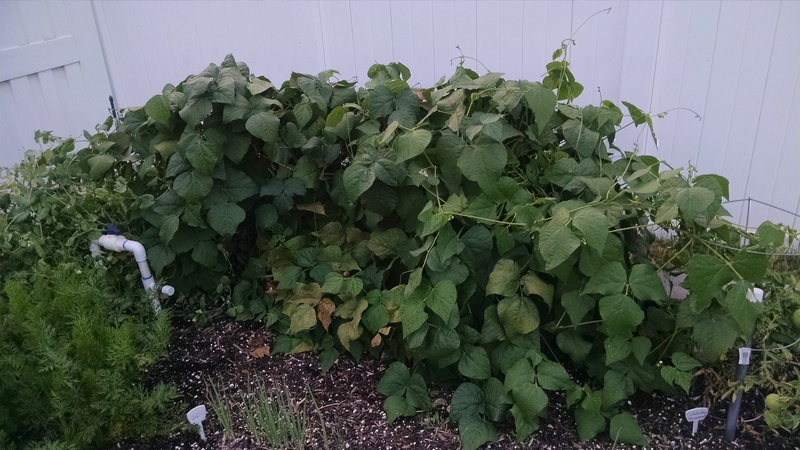 Bush beans grow to be about 2 feet tall. If you space the plants properly, they usually don’t need trellising. Some bush bean varieties include Jade, Contender, and Blue Lake. Pole beans, on the other hand, can grow to be 8-10 feet tall, and need a trellis to climb up. Some pole bean varieties include Rattlesnake, Spanish Musica, and Kentucky Wonder. 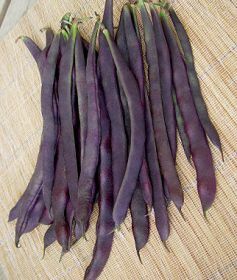 Did you know that there is a pole bean that is purple?! It is an Italian variety called “Trionfo Violetta”. I haven’t tried purple beans yet, but now I want to! Bring a pot of water to a boil and cook the green beans until tender and bright green. Drain and rinse the beans and set aside. Chop the egg and bacon strips into small pieces. Cut tomato into chunks. In a small measuring cup, mix the Dijon mustard, olive oil, and red wine vinegar. Place the beans, egg, bacon, and tomato in a large bowl. Drizzle the Dijon mixture (vinaigrette) over the green beans, egg, bacon, and tomato. Sprinkle with salt and pepper. Mix together, eat, and enjoy! (This make enough for one large salad or two small side salads). I hope you enjoy this salad as much as I do! And please tell me about your green bean growing experiences. What varieties of green beans do you like to grow in your gardens? Which are your favorites to eat? Do you have any other green bean recipes that you love?! Thanks, and enjoy the harvest! These 7 Cast Iron Pieces Make a Perfect Collection! Are You Craving Fall Weather and Food? Best Way to Keep Fresh Herbs FRESH! What to Do with Those Glorious Green Tomatoes! Grilled Corn: To husk or not to husk - Two Ways to Try It! What is the Best Natural Way to Wash Fruits and Veggies? Mass Producing School Lunches - Awesome idea! KLM Lost and Found - This Is How It Is Done! Are the kids having fun?